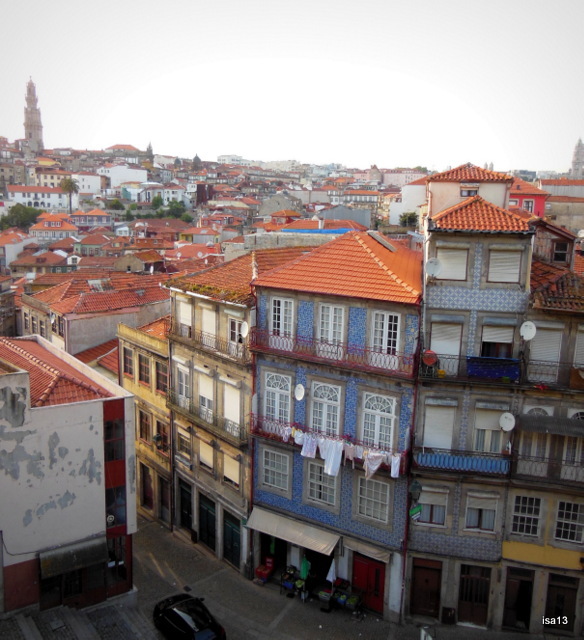 On the second day of our visit to Porto, we walked down from the top of the hill through a maze of steep paved streets leading to the Ribeiro district. 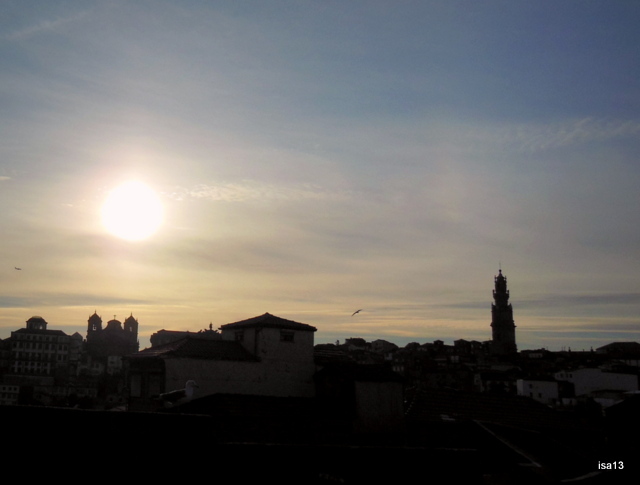 7.30 am in Ribeiro, one of the oldest and liveliest parts of Porto. 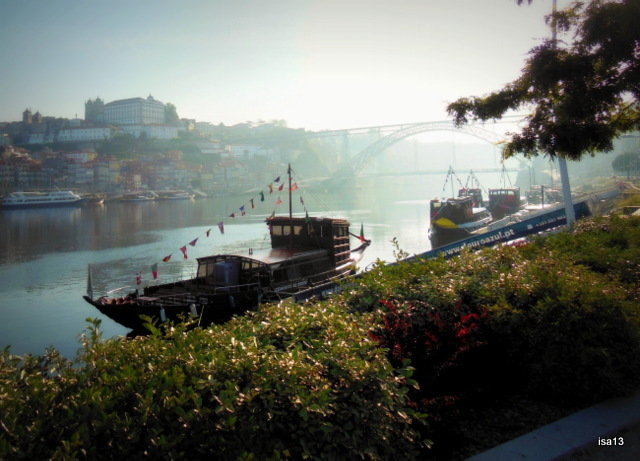 The Douro river flows slowly in the misty morning. The city looks still sleepy and the air is pleasantly cool. 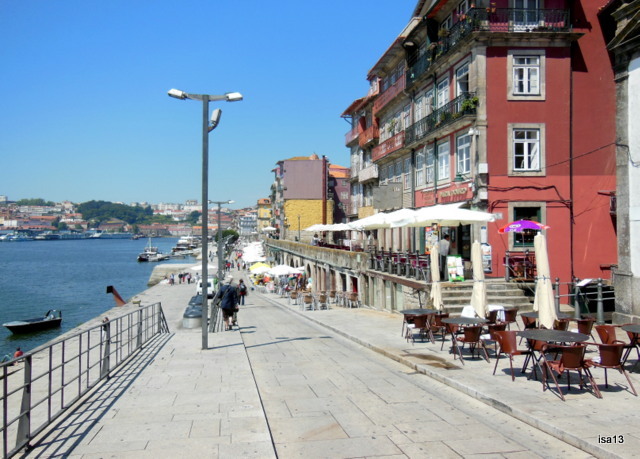 It will get very hot later on as we will visit this lovely area that is sometimes called the true soul of Porto. Tall, narrow houses line the side of the river. 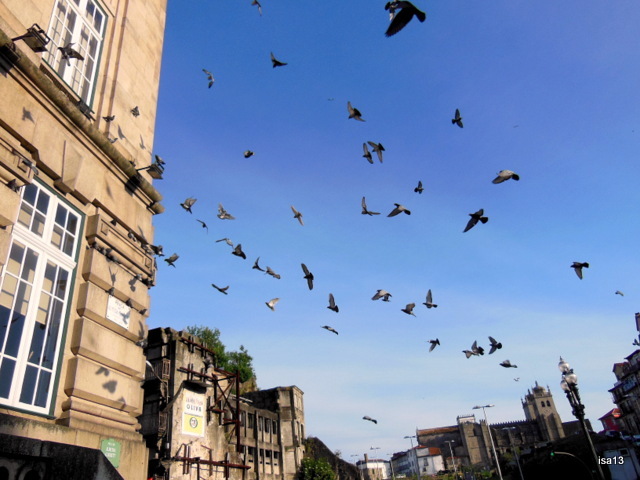 The day had brightened up and the wave of heat around midday was almost palpable. A hazy kind of light. Not really the best time for taking pictures but we were hungry and the smell of fried food, roasted sardines, lead us to a restaurant along the quay. A long and wide promenade runs along the river. There were few tourists at this time of the year but I can imagine how crowded this would look right now. I took this picture from a bridge we are going to cross later on. Houses, shops, market stalls and restaurants blend in colorfully. A luminous sight indeed. 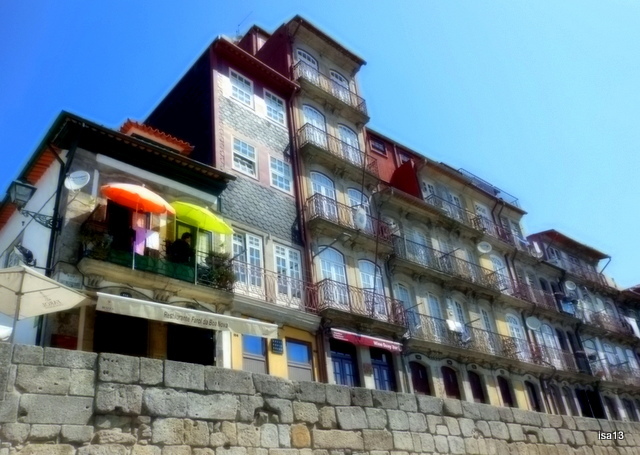 A closer view of the terraces along the Douro river. I had promised myself to take a “food” picture of the dish I ordered : “sardinas asadas”, the absolute must when you visit Portugal. Roasted sardines. When the waiter brought a large plate where four delicious looking sardines lay side by side on a bed of salads, I forgot all about my promise 😦 The inviting scent, the cool white fruity and fragrant wine, the first bite into the sardines’ delicate flesh… and when I thought about the picture, my plate was empty ! But I can assure you it tasted very good. A few boats were anchored as we walked towards the bridge crossing the river. 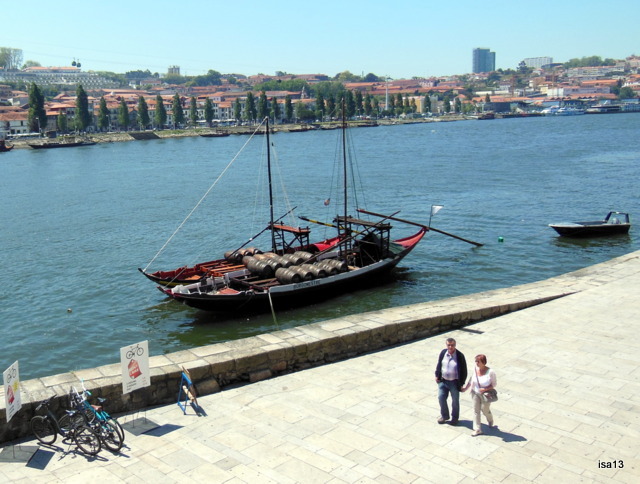 This old boat is one of those Rabelos – ancient barges with a flat bottom – the type that used to transport barrels of the famous Port from the Douro Valley to Porto. 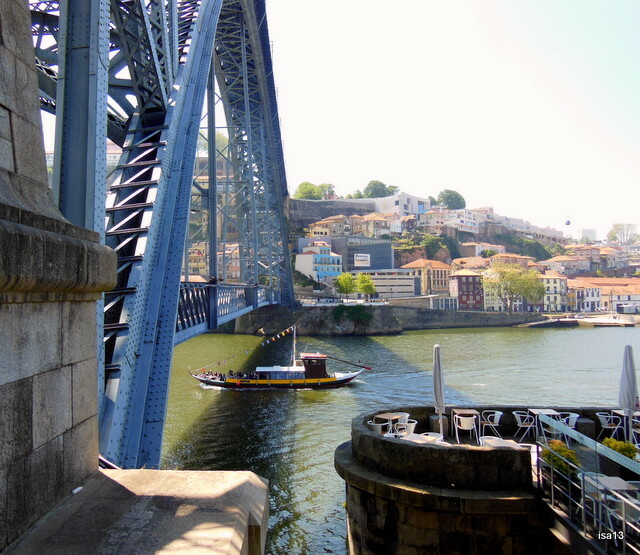 Dom Luis I Bridge, constructed in 1886 on the lines of Gustave Eiffel’s Dona Maria Pia railroad bridge. Each level has two-way traffic and two sidewalks. It was fascinating and challenging to walk across the bridge with cars and buses racing by all around. 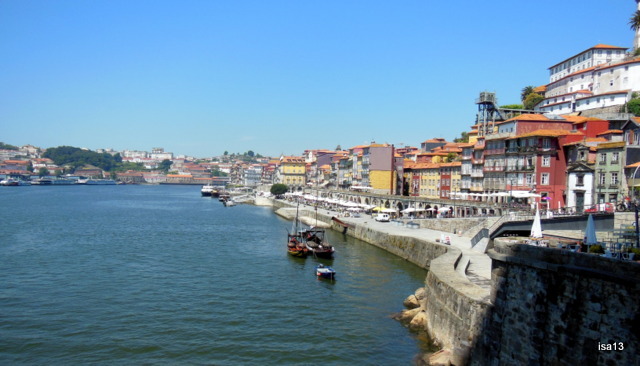 On the other bank of the Douro river lies Vila Nova de Gaia, the well-known place of wine and wine lodges. Some of them are open for visitors and wine tasting. 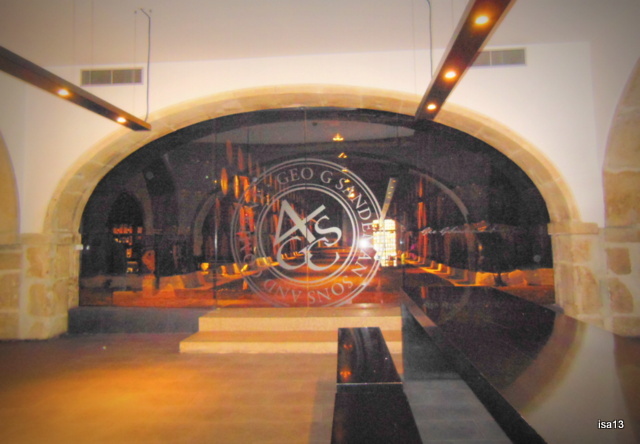 The large cool cellars in the wine lodge we visited were a real reward after the walk in the blazing sun. My husband and I sat happily on one of those long black benches where a large group of Japanese tourists joined us later on. Behind dark glass doors, a lot of wooden barrels were neatly piled up. The golden lights in the ceiling gave the room and the barrels an air of an Ali Baba’s cave. We tasted a glass of two different vintage Port. Exquisite ! Do you believe me if I tell you that after the long walk since early morning, the hot sun and the wine my legs felt kind of tired ? Never mind. 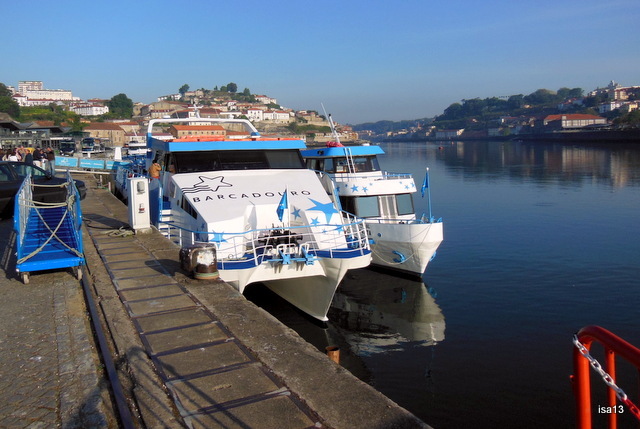 The following day was going to be a relaxing one : a one day cruise on the Douro river, along vineyards, forests, small villages. We joined about 60 other people on a boat such as the one of the right, the smaller one. Are you ready to follow me for an enjoyable journey ? Then don’t forget your sunglasses, a hat and your favourite sun cream: the day is hot on the deck ! where I stayed during the last week of May ? During the two hours flight from Geneva to this ancient and picturesque town, I had a look at this map and thought I would share it with you. 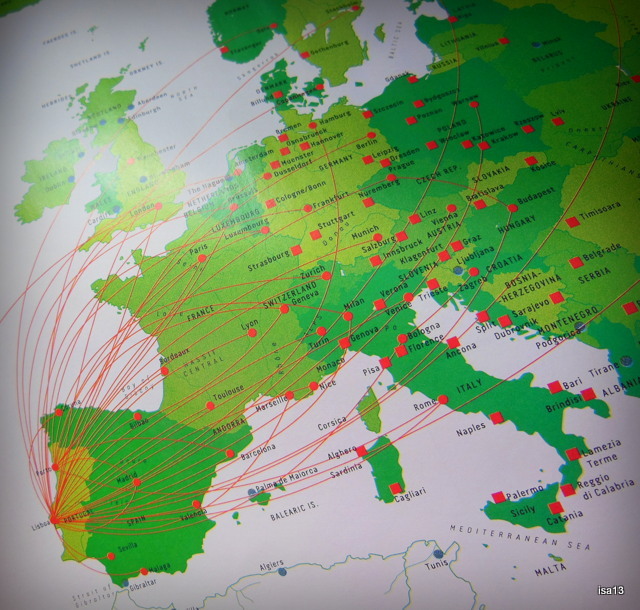 The many flight lines all seem to converge to one particular spot in the South of Europe. A small country on the Atlantic coast from where several navigators left for maritime discoveries : Africa, America, Brazil, India, Macao (China). Great explorers like Magellan, Vasco de Gama, Zarco amongst many others. 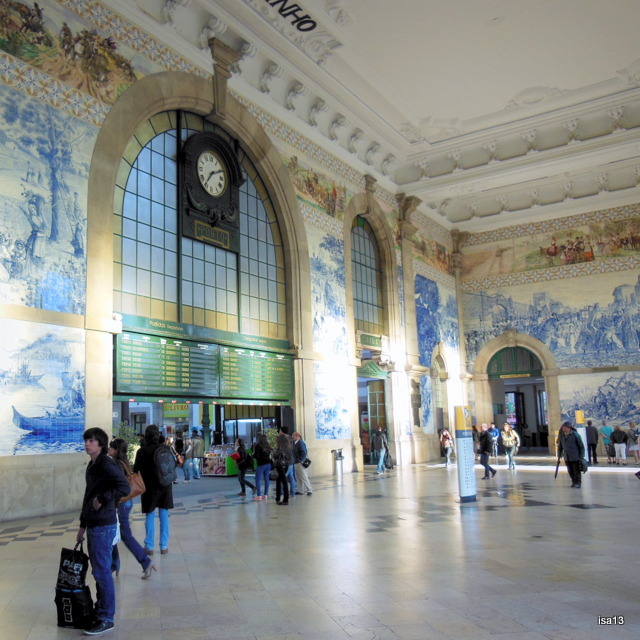 Our destination was Porto – or Oporto – in the Northern part of Portugal, an old city we had been planning to visit for a long time. Spring was much more advanced than in Switzerland, the touristic Season had not fully started yet, temperatures were pleasant. Our timing was good, it truly was the most enjoyable vacation. 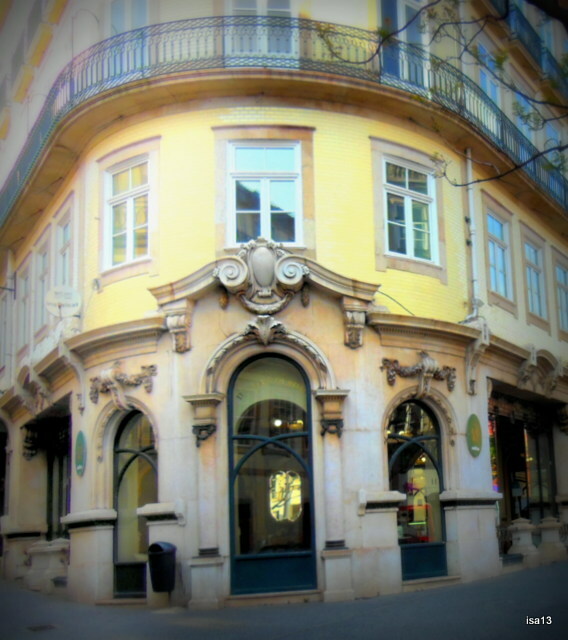 Porto and surroundings offer so much to a new visitor that it would be impossible to tell you about all its various aspects. Let me just show you in a few posts the pictures of some of the places that touched me for a reason or another. 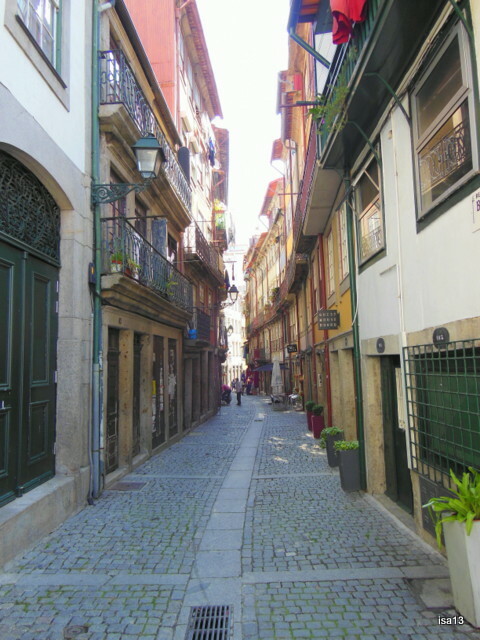 This is the first post of a few others showing you different glimpses of Porto, the Douro river and Coimbra, a town in the South of Porto.